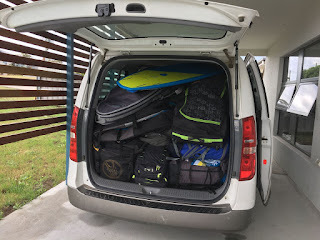 This is summary of our late spring kitesurfing trip to Tasmania. The wind forecasts shifted a lot during the preceding week. Initially Marrawah looked good but closer to the date a large high pressure system in the Tasman resulted in a northerly air stream along the East coast so we booked a large house in Stanley to sleep eight. Flying over the Tamar, looking back to Port Sorrell in the distance where we kitesurfed last year. On arrival, we found the Kia Carnival seat configuration did not fit us and our gear well, so we were lucky to swap it for a Hyundai iMax. We checked out the Friendly Beaches on our way back to Swansea - looks promising for kitesurfing! We had a great house in Swansea that slept all eight of us and had plenty of room and good views across to the Hazards. Kiters & boards - Taz, Mike, James, Anthony, Peter, Dan, Stu S, Stu W.
Day 2. Sat 25 Nov.
Day 3. Sun 26 Nov. 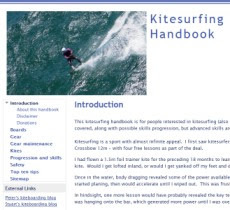 Session 427 [link] - Douglas River surf then a downwinder to Bicheno. Five had another session at the wonderful Friendly Beaches, while three or us returned to Bicheno to order pizzas. We scored some nice pancakes and jam at Kates Berry Farm near Swansea. We drove to Coles Bay then walked to the Wineglass Bay lookout in Freycinet National Park, some continued to the beach and back. Its a very popular walk for tourists. Then it was a quick dash to the airport with a 5 minute lunch stop on the way. A final bag pack and we were on our way home. Wilsons Prom and Shallow Inlet look great from the plane on the way home, its good to have a window seat.